Please report any broken links or trouble you might come across to the Webmaster Please take a moment to let us know so that we can correct any problems and make your visit as enjoyable and as informative as possible. Laid down, 27 October 1939, at Puget Sound Navy Yard, Bremerton, WA. Decommissioned, 17 December 1952, and laid up at Curtis Bay, MD. two Diesel-drive 200Kw 450V A.C.
34k USS Biscayne (AVP-11), painted camouflage scheme 12(modified), underway, date and location unknown. 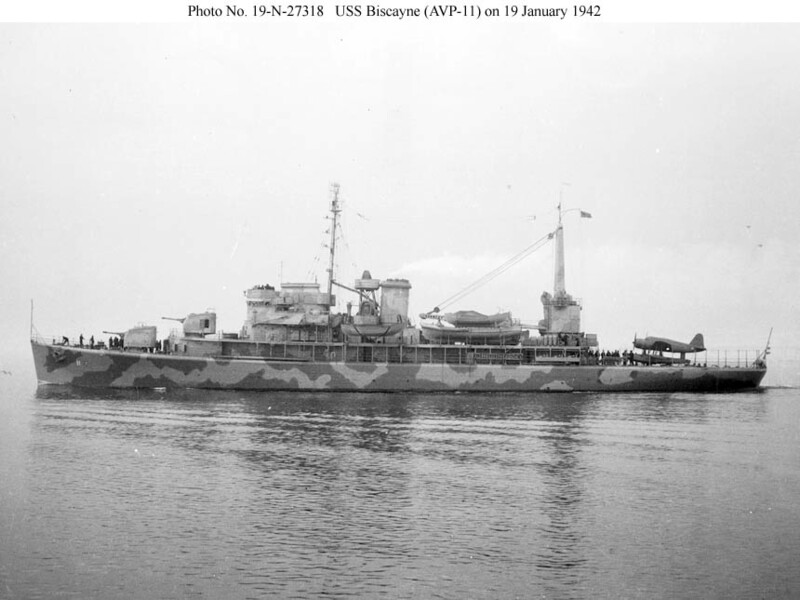 85k USS Biscayne (AVP-11), painted camouflage scheme 12(modified), broadside view, at Boston Navy Yard, 19 January 1942, in her original configuration with a large crane and clear fantail for handling aircraft. She is carrying a Vought OS2U "Kingfisher.". 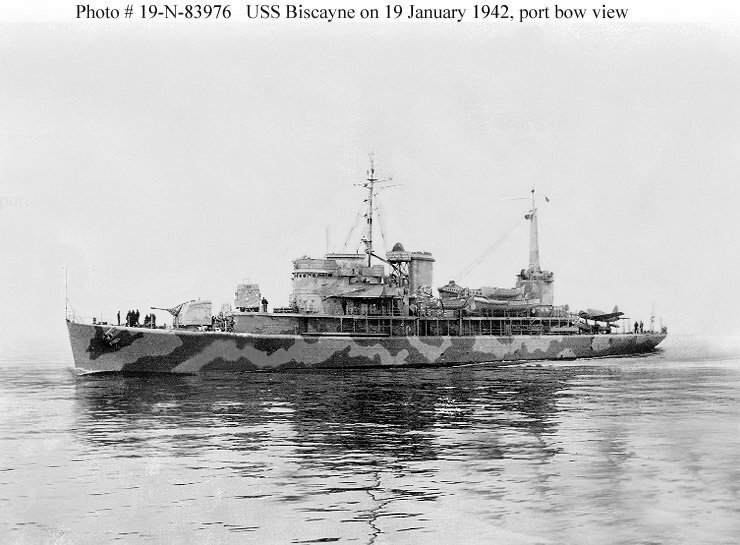 95k USS Biscayne (AVP-11), painted camouflage scheme 12(modified), port bow view, at Boston Navy Yard, 19 January 1942, in her original configuration with a large crane and clear fantail for handling aircraft. She is carrying a Vought OS2U "Kingfisher.". 76k USS Biscayne (AVP-11) near Boston Navy Yard, 19 January 1942, in her original configuration. The first two ships of the class were completed to the original design for the class with a large seaplane handling crane and a clear fantail onto which it could lift seaplanes for servicing. The aircraft shown here is a Vought OS2U Kingfisher. 81k USS Biscayne (AVP-11), painted camouflage scheme 12(modified), port quarter view, at Boston Navy Yard, 19 January 1942, in her original configuration with a large crane and clear fantail for handling aircraft. She is carrying a Vought OS2U "Kingfisher.". 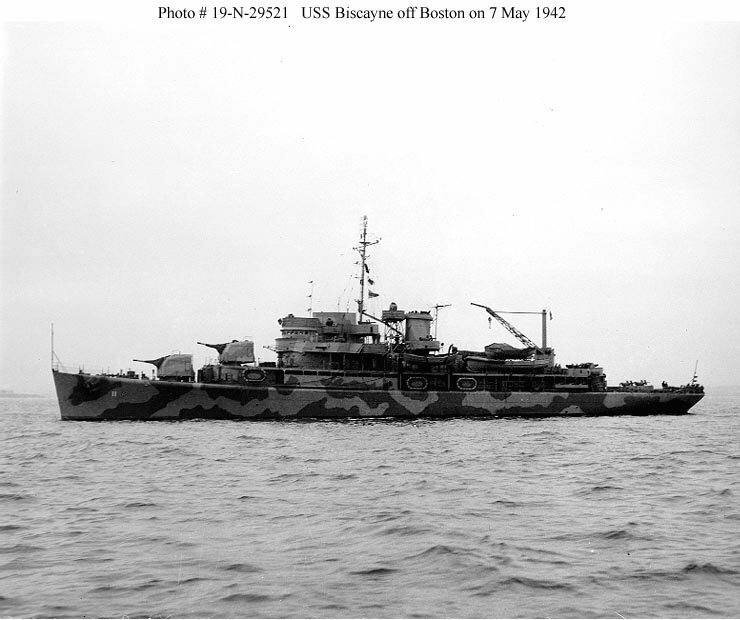 71k USS Biscayne (AVP-11), painted camouflage scheme 12(modified), off Boston Navy Yard, 7 May 1942. Her large seaplane handling crane has been replaced with a smaller model and she now carries anti-aircraft guns on her fantail. 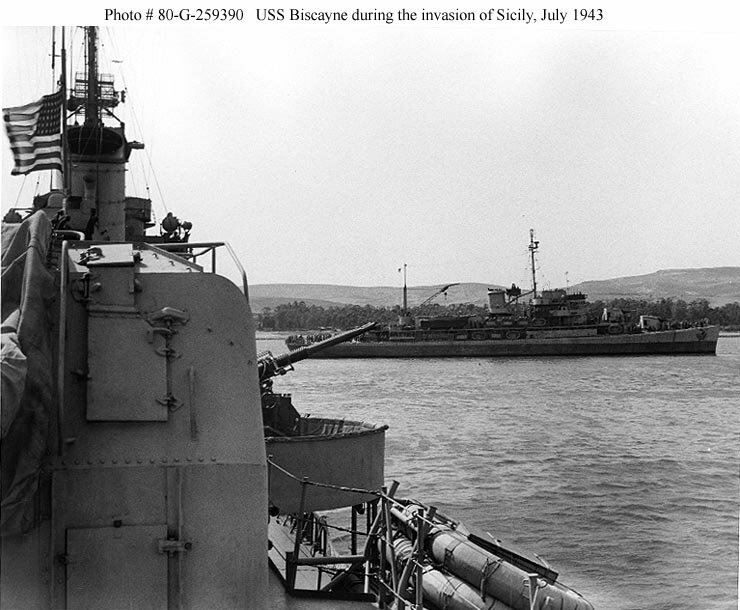 93k USS Biscayne (AVP-11), serving as the flagship of the "Joss" (Licata) invasion force during the invasion of Sicily, July 1943. Photographed from USS Buck (DD-420). 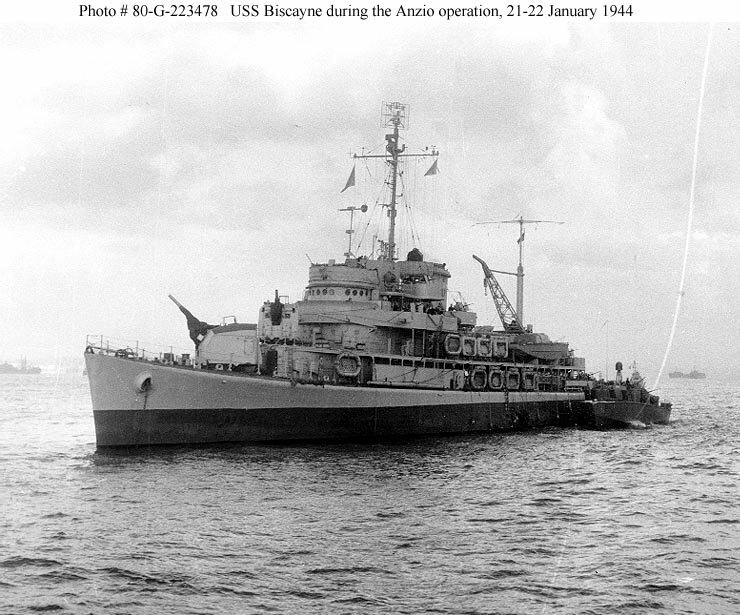 112k USS Biscayne (AVP-11), serving as invasion force flagship for the Anzio landings, 21-22 January 1944. Photographed from USS Frederick C. Davis (DE-136). Note the PT boat alongside. 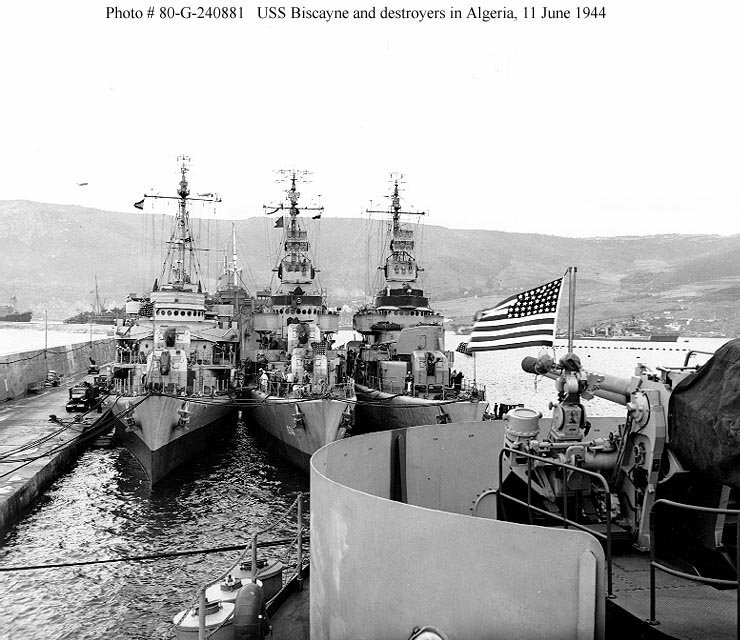 112k USS Biscayne (AVP-11), docked at Arzew, Algeria, 11 June 1944, during amphibious exercises there. 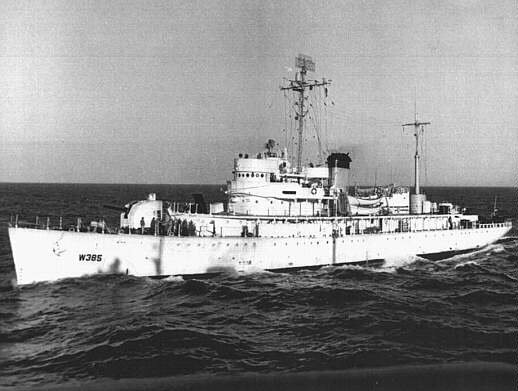 USS Doran (DD-634) and USS Cowie (DD-632) are outboard. Photographed from USS Catoctin (AGC-5). 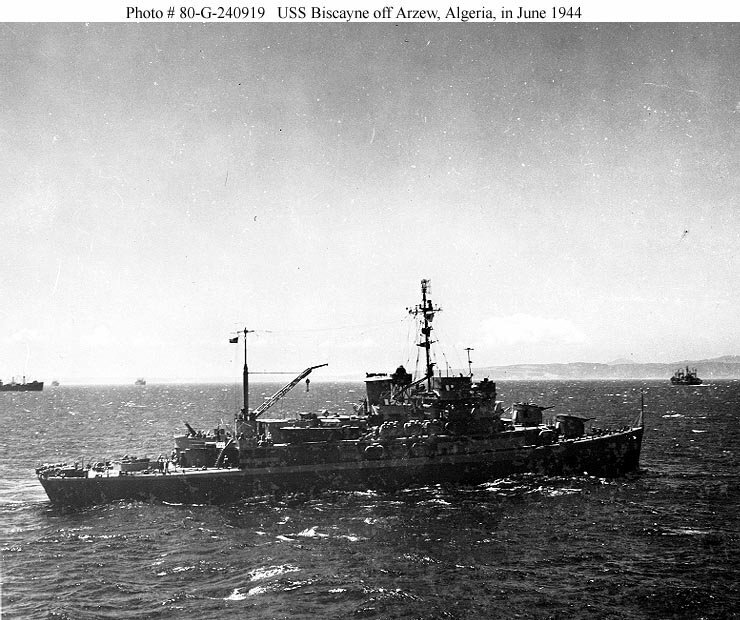 115k USS Biscayne (AVP-11), participating in amphibious exercises off Arzew, Algeria, as flagship of RADM B. J. Rodgers, 10-11 June 1944. Photographed from USS Catoctin (AGC-5). 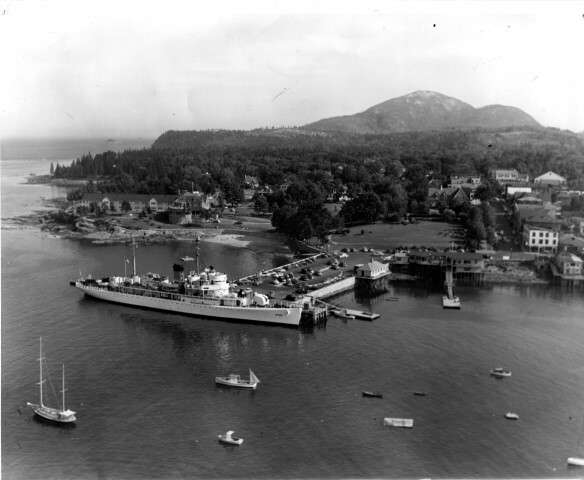 65k USCGC Dexter (WAVP-385) at the Bar Harbor, Maine Municipal pier during a port visit 1-5 April 1950. 127k USCGC Dexter (WAVP-385) under way, date and location unknown. 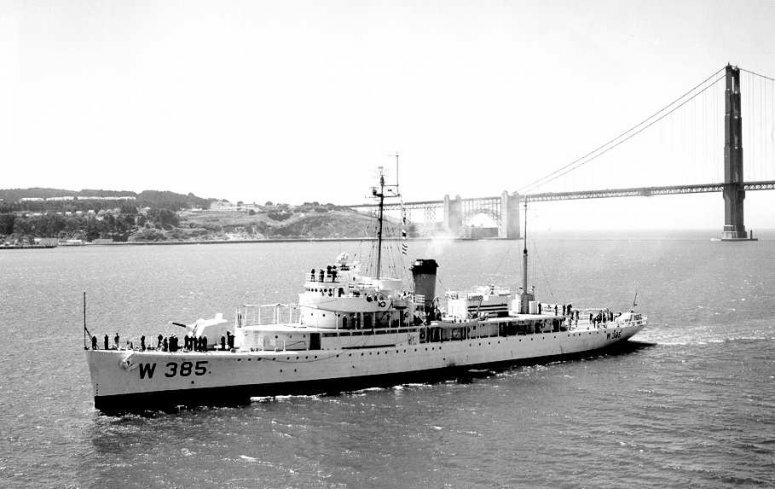 40k USCGC Dexter (WAVP-385) under way, date and location unknown. 64k USCGC Dexter (WAVP-385), 12 August 1958. Original caption: "Coast Guard Cutter Dexter Approaches New Homeport. SAN FRANCISCO, 11 August.--The U.S. Coast Guard Cutter DEXTER entered the Golden Gate at noon today enroute to the Alameda Coast Guard Base, her new homeport. The DEXTER will primarily run offshore cruises for the training of Coast Guard reservists. 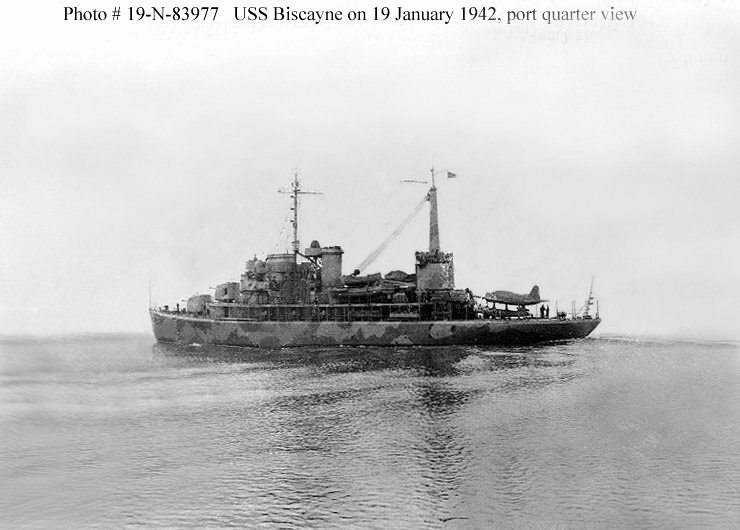 During World War II, the vessel was the Naval USS BISCAYNE, which served in the Atlantic, Mediterranean and Pacific. 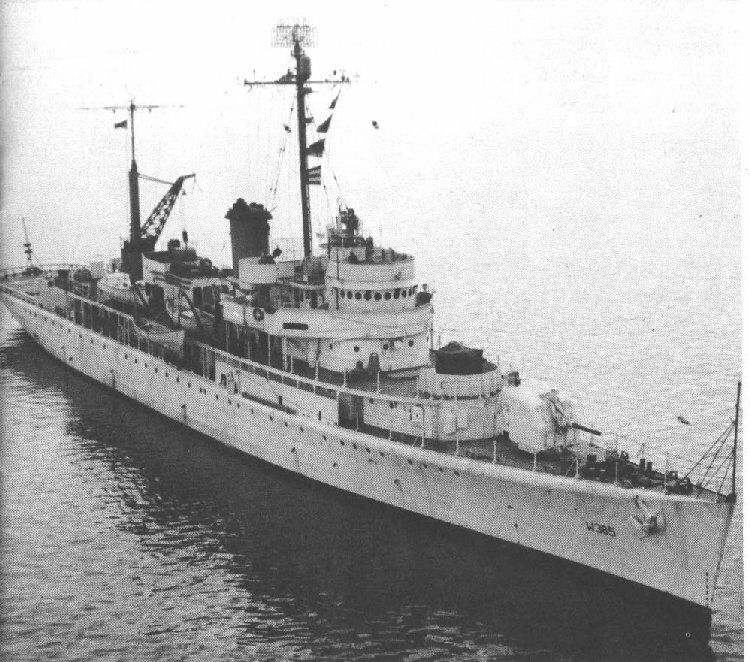 Turned over to the Coast Guard in 1946, and re-named DEXTER, she served as a North Atlantic Weather Patrol vessel until 1953 when she was decommissioned. After reconditioning at the Coast Guard Yard in Curtis Bay, Maryland, she was recommissioned last June 30, and last month began the voyage to her new station in Alameda. 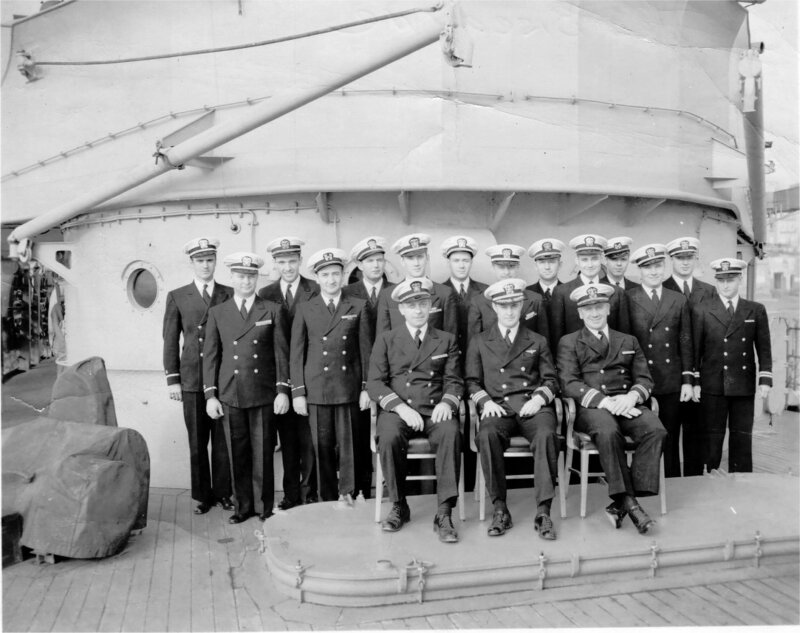 Commander Bainbridge B. Leland, USCG, commands the DEXTER, which carries his staff of eight other officers, ten Chief Petty Officers and 65 enlisted men. Many of the DEXTER personnel will make their homes in the East Bay area." 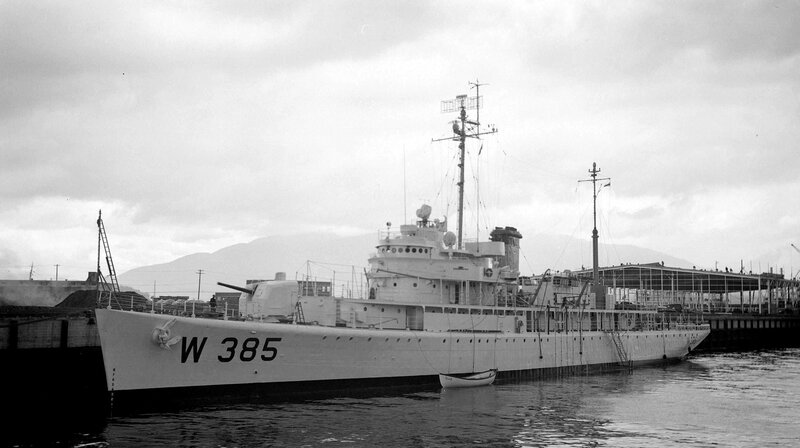 583k USCGC Dexter (WAVP-385) docked at Vancouver BC on May 27, 1960.